New Delhi: Starting with a tiny clothing store in Kolkata in 1986, Ram Chandra Agarwal built Vishal Retail Ltd into one of India’s biggest supermarket chains, with 170 outlets countrywide. But some present and former employees complain that 23 years later, the chairman and managing director still runs the chain like a small enterprise rather than as a listed, professionally managed company that earned Rs1,323 crore in revenue the last fiscal. Agarwal, these critics say, tends to keep all decision making powers with himself, giving little autonomy to executives in overseeing operations of the discount retailer. They blame an exodus of senior managers from the firm on the founder’s style of functioning. Agarwal, for his part, denies the allegations. At Vishal Retail, executives don’t have the authority to write cheques for even tiny amounts, complained one senior company official who asked not to be named. 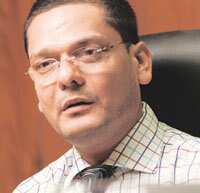 Within months, Vishal Retail has seen the departure of top managers, including president Lalit Kumar, head of the apparel division Arun Arya, head of corporate affairs Manmohan Agarwal (not related to the founder), head of accounts and finance Amit Chaturvedi, and vice-president of accounts and finance Sanjay Goel. Agarwal, who is now 44, said his company had let go some top officials as part of cost-cutting initiatives to tide over the economic slump that has hit retailers hard. “We wanted to restrict our expenses and those were all high-paid executives," he said, conceding that some had left for other reasons. “Maybe the environment didn’t suit them," he said. After quitting his job as an assistant manager at a Kolkata metals firm, Agarwal opened a 150 sq. ft store selling ready-made garments in the city in 1986. He prospered selling branded jeans such as Wrangler and Pepe. In 2001, Agarwal shifted base from Kolkata to New Delhi and started his first supermarket. The company expanded sales at an annual growth rate of 80%, from Rs88 crore in 2004 to Rs288 crore in 2007; during the period, net profit jumped from Rs38 lakh to Rs12 crore. Then he hired professional managers to help him run a retail network that had by then spread to many parts of India, as the company planned to sell shares to the public. Vishal Retail’s initial public offering (IPO) was a notable success. The IPO was over-subscribed almost 70 times although the issue opened on the same day as a share sale by the country’s largest developer DLF Ltd. Vishal Retail’s shares soared 75% on their debut. Present and former employees say Agarwal squandered the opportunity to let professionals take the company to the next level of growth. “Initially, many organizations are closely held and controlled by entrepreneurs, but when you grow, you have to let go those controls to professional points," said a former executive, who asked not to be named. “I think that decision of letting go of power never happened." Agarwal denies the allegations. Had he been too rigid in his style of functioning, the company couldn’t have grown to its present size, he said. “Freedom should come through accountability and I always wanted (that if) any executive wants freedom, he should be accountable for his job," he said. “And I think it has not been allied well—the freedom with the accountability." Lack of freedom to take decisions and implement plans led to frustration among many in the top management, according to employees past and present. All the “decision making by and large was centralized at one seat," said the former official quoted earlier. “The set-up for a large organization which should be there in terms of clearly demarcated and defined roles and responsibilities, and their measurement of their performances against those deliveries, is not there and that creates a lot of confusion in the organization." Former associates also grumble about Agarwal’s insistence on top managers reaching their offices by 7am to attend daily yoga sessions, although the founder says these weren’t mandatory. One former executive described Agarwal as a “man in a hurry" who insisted on quick results, not always possible in a time-bound business such as retail. The criticism has grown louder amid the economic slowdown that has added to Vishal Retail’s woes. Like many retailers, Vishal Retail has not only had to close stores, but abandon expansion into a footwear chain, restaurants and cash-and-carry wholesale outlets, among other formats. Vishal Retail closed its warehouses in all regions, save one near Gurgaon on the outskirts of New Delhi, to save on costs. It reported a net loss of Rs90 crore for the quarter ended June, compared with a profit of Rs10 crore for the same period last year. It’s a tough situation for Vishal Retail, which has almost Rs730 crore in debt and an almost equal amount’s worth in unsold inventory that the company has been trying to get rid of by offering discounts. “Their gross margins have declined substantially," said a Mumbai-based analyst who tracks the company. Margins have slipped to 19% from as much as 40% in the past, partly because of the discounts being offered on inventory. “You have to free up capital as you are not getting debt from the bankers. Then how else would you run your business? You are burning cash right now and you have to pay up, and their cash flow is also not at a great level," the analyst said on condition of anonymity. Agarwal admits the company is selling the inventory at “less than the market price" in a bid to get rid of it in a year’s time. “It is affecting (the profits)…it has affected (profit) in the last two quarters…if it (inventory) is liquidated, the whole scenario will change and we will see (a) good future," he said. Meanwhile, the company’s plans to raise at least Rs200 crore from the markets have not moved for months. The company stock closed trading on the Bombay Stock Exchange on Tuesday at Rs57.15, 92% down from its closing price of Rs752 on its listing day in July 2007. Vishal Retail is offering shares to some of its big manufacturers and suppliers instead of cash, and is struggling to raise money for daily operations, Mint reported on 6 August. Agarwal denied this at the time and said “nothing of this sort is happening", but added that he is open to offering equity shares instead of cash to vendors. The founder conceded that the company is currently “facing a fund crunch". “The basic essence of the company is to get fresh goods, and if we get the fresh goods by giving some in terms of shares, I think it’s not a bad idea," he said. Jharna Mazumdar in Mumbai contributed to this story.